Our Halloween – BOO Ghost Bag will allow you to market your brand discreetly. The “in your face” advertising does not work as effectively as discreet advertising works, especially during the holidays and special occasions such as Halloween. Invest in our consolidated bags to ensure your brand receives the exposure it needs to blow up in the market. 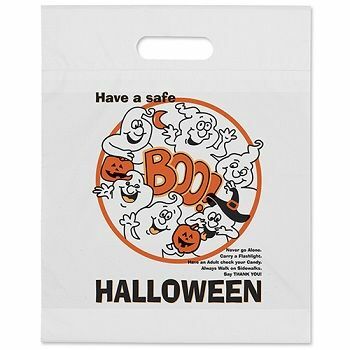 If you are throwing a Halloween party for kids, you can give our candies in our BOO Ghost bags. Our courier bags also make great promotional tool for businesses with an audience made up of mostly kids. If you are looking for Halloween bags with friendly and smiling ghosts, you have come to the right place. Use our Halloween bags to boost your marketing efforts because come Halloween, each kid you gave the bag too, will be seeing carrying it on Halloween. Our Halloween – BOO Ghost Bag will put a smile on small kids and give your business the boost it needs to become a known name.